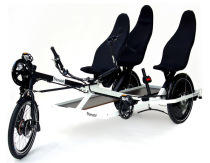 Home News World premiere at EUROBIKE: Recumbent study Toxy-TT lite 12,5 kgs Order now until Oct. 15th! 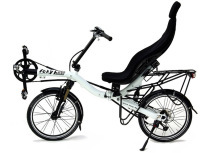 At 12,5 kgs, it is the lightest full suspension Toxy recumbent ever built. - And you can order it right now until Oct. 15th. 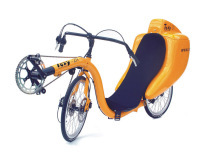 So with your TT-lite 2006, you will enjoy some of the most exciting spring rides you have ever had. Coming with lightweight alloy frame, carbon fibre seat & crankset, light cnc air shock, and brand new system wheel set with Swallow Stelvio light tyres, the worlds lightest recumbent tires. Your Toxy-TT lie frame will be manufactured & welded for you personally, all lite components will be manufactured specially on demand. In February will assemble each TT-lite and adjust it individually. Early March, we will ship your Toxy-TT lite. This unique model, we only can build in wintertime, so we can not accept orders later than Oct. 15th 2005. Sorry.